Men with long, wavy hair have an added advantage for sporting cooler hairstyles. Long hair frames the face to give it an impressive look. 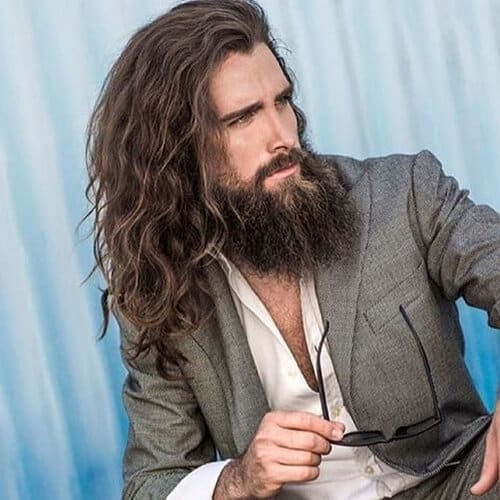 At the same time, men who are growing their hair out to be long also deserves some stylish guidance for their potential long mane. Even if you are unsure whether you want to grow your hair out or not and looking for hairstyles that would give you room for thinking, you can find some hairstyles in the 30 noted down here. This wavy hairstyle is for the men with curly hair who are growing their curly hair out to be longer. A very prominent shave in the bottom and sweeping the hair aside would give a great look. This look goes great with wavy hair because this hair type adds more personalized textures to it. Another good hairstyle for men with hair “not that long”, but on its way to growing out. Groom your wavy mane in angular shape in one side and sport a strong undercut to the other side. This way you are all set for both the heat and the style. You can sweep the longer side to the back with products if needed, otherwise let it hang loose also makes a great look. Fishtail braids might be a little too complicated for men who are new to braiding, but if you can manage a little help from a friend or your stylist and learn how to braid, this is a rather stylish way to wear your long mane of wavy hair. Men with long wavy hair have the added advantage of having their own natural waves to the hair, which adds more to the look. This is also very functional for men as well. Not sure whether you want to keep your long, wavy hair growing or not? How about styling it with products or maybe getting a few snips to make it look presentable before any drastic decision. Style your longish hair in part and ruffle it up, if you fancy. Or just slick it up maybe. Either way, your long wavy hair will look great with any outfits. Reverse braid embodies functionality and style. 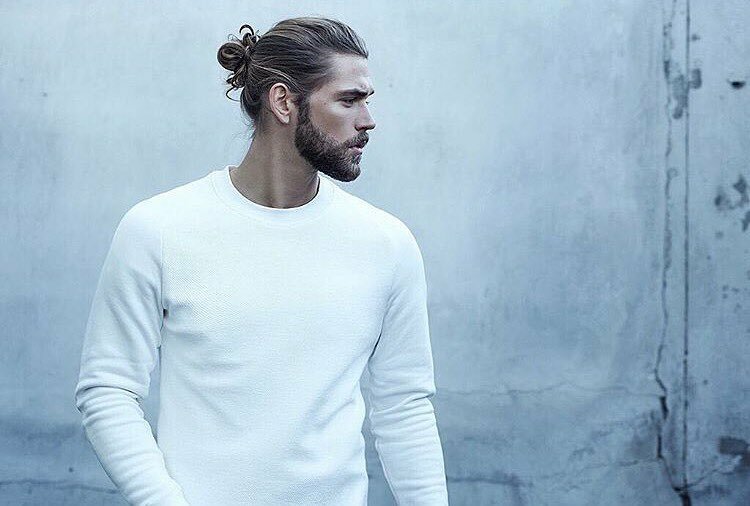 Braid up your long, manly, and wavy hair bottom up and tie that in a bun on top. You’re all set for a rigorous gym session or an after works basketball game. From suits to beach shorts, you can rock any article of clothing in this hairdo! Why not experiment with colors when you’ve got long, wavy hair? If you don’t mind coloring, you should definitely trying getting colors on your long hair. Playing with colors gives your hair a new, playful, and vibrant look. Especially during summer holidays, two-toned hair looks rather good. Bouncing your head full of long, wavy mane of two-toned hair is just incredible at campfires. This is also an asymmetrical hairstyle for men with long wavy hairstyle. 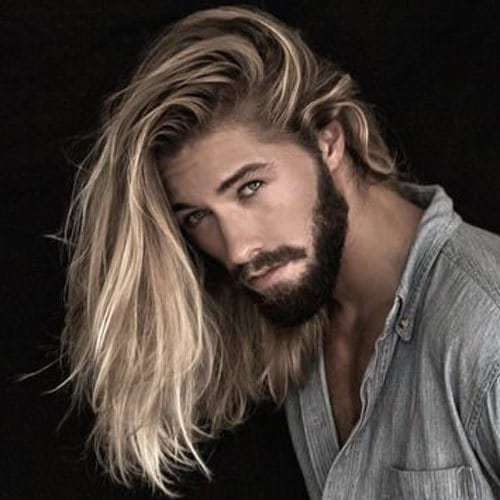 Men with growing out long wavy hair and with already full length long hair can adopt this hairstyle easily. Asymmetric hairstyles are pretty hip right now. You can style the hair with products or just let the wavy mane hang loose, and air dry after shower or a spritz of water. Either way, it looks great. Retro hairstyles are never out of fashion. Men with growing out wavy hair cans sport retro hairstyles while going through the transition of long, billowy hair. A retro quaff is always stylish whether you’re wearing formal or informal outfits. Edgy and asymmetric cuts suit men’s wavy hair like clove. If you’re halfway growing your wavy hair out, you can style that mane in this hot summer in Edgy styles. This will give you comfort and style. Cut it in asymmetric shape and maybe sport a fade in one side. If you have a beard, this will turn your look into super-handsome one. If “styling” is too much for you, then just let it be. If you’ve got a tick mane of shoulder length wavy hair, you’re in luck. 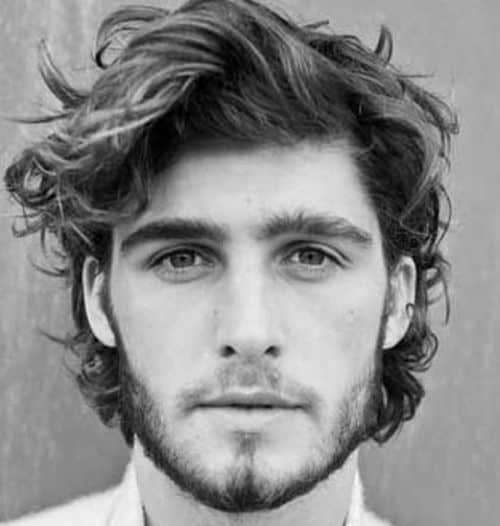 Shoulder length thick hairstyle is pretty cool for men with wavy hair. You can effortlessly look cool and smoldering by letting your shoulder length thick hair down. If you have a thick, long, and wavy mane of hair, this is an ideal and functional way for you to style your hair. Tie up your long mane on your back. You are all set for a busy day. Your stylish mane won’t distract you by dangling on your face. If your hair grows out faster in front than back, then you can use this style to your advantage. Wear your hair like the iconic 1950’s gentlemen with long, billowy curls in front. For the men with long-ish wavy hair, this is a cool hairstyle. Wavy mohawks go well with style and functionality. In summer, you can beat the beat the heat and sweaty scalp with the shaved sides. With the Mohawk on top, you can still be stylish. Long bangs are cool in summer. You can sport the fringe with strong undercut. Or you can roll it with a strong back cut. If you have naturally long, wavy mane of hair and a very little time to maintain right now, just let it hang down loose. Let it air dry after a good morning’s shower, the whole journey from morning to night will be a treat for you. If you have a beard, that will be added a bonus to your look. College boy hairstyle is a popular throwback from late 90’s to early 2000’s. This one goes particularly well with longer wavy hair. It is easy to manage and perfect for any weather and occasion. Sweep your mane back with some hair products, no combing necessary. This style gives you a rugged, yet neat look. Perfect for semi-casual settings. If your hair grows faster in front, then wavy fringe at the front would be a good hairstyle for you. For men who are growing out their hair to be longer can adopt this style. This will help you to look cool and relieved in the summer heat. Relaxed and billowy long wavy hair is good for easy-maintenance. It is perfect for chilly days, you don’t have to worry about the “aesthetics”, your wavy hair will take care of it with the texture. You can rock it with any outfit. Don’t worry if your hair doesn’t grow “down”. Your wavy hair is an asset anyway, and you can style it long on top without much fuss. With the help of your stylist and some products, let your long wavy mop of hair go messy on top. If you like to keep wavy hair longer, but don’t want it to distract you at work, this style is perfect. Slick up your mane with some products. The best part of having wavy hair is, its weight will hold it down when you will use the product. You can rock this trick with any length of long wavy hair, but would be perfect for medium-long hair. Flow hairstyles suit best in wavy hair. Especially when it is medium-long, it works rather well. The wavy texture adds a layered effect to it. For the bearded pals out there with long hair, it does not take much for you to look handsome. Your beard and long locks are already enough. Let the hair down, use some soft hold products to induce some shine on it- and you are good to go. Ruffle your wavy long hair up on top, and crop it in the bottom. This is fashionable, functional and healthy for summer. You will have the long, wavy hair on top, which you can have in “messy” style with the help of hair products. That will be a cool, laid-back style for busy summer days. Wavy Fringe and Taper Fade is a great combination. Your wavy hair will give you’re a stylish look in a fringy situation. 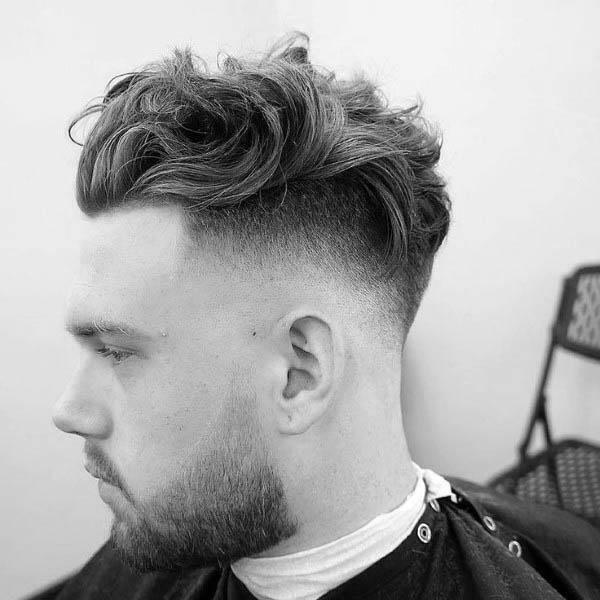 The taper fade will provide relief from summer heat, a great tradeoff in balanced and healthy summer hairstyle. In summer, if you are not willing to let your long, wavy locks go, this is something you might love. Part your wavy hair to a side, make a strong undercut fade and line it up top. Fauxhawks are cool. You can sport it in many ways than one. However, long fauxhawks with strong undercut is a rather good hairstyle to sport. Quiffs are stylish. If you are growing your wavy hair out, try it. Bring out the textured look by layering it up. This will be a cool hairstyle for you in summer. Combover hairstyles are cool. Sport it with the strong part, and you are all set. In summer, this is a stylish, functional, and comfortable hairstyle for any occasion. Bleach your wavy mane. This is a statement hairdo for handsome young men. Sport it with your undying spirit of youth. You might do some highlighting streaks for added effect. You can add your own personal modifications to these wavy hairstyles for men with long hair. Wavy hair is often associated with handsome and smoldering looks. Artists, actors and celebrities like Hozier, Dave Grohl, JC Chasez, Owen Wilson, Brad Pitt- are famous for appearing with long wavy hair at times. You don’t have to be a celebrity to look like one, right?